Edmund Hillary and Vasco de Gama had one thing in common – the spirit of adventure. While one conquered Everest, the other almost conquered the sea – with the same spirit of adventure! That exact spirit – adventure – is what took the two Master Mariners – Capt. Avinash Batra and Capt. Somesh Batra to venture into a highly qualitative Shipping and Logistic business in India, after a long stint at sea ! Today, Seahorse Ship Agencies Pvt. Ltd. is a unique local professional company for providing Global Cargo Transportation Service within India. Our strategic Pan-India service network with well-coordinated complementarity has made Seahorse a unique name in the International Shipping and Logistic arena within India. Seahorse owes its origin to vision of two ex-Ship Masters, Capt. Avinash Batra and Capt. Somesh Batra whose years of sea-faring adventurous spirit was replicated to business entrepreneurship in land based activities. The founders foresaw the need for quality shipping and related services in the rapidly expanding maritime trade in India. They formed a company based on professionalism and integrity, thereby creating a unique brand equity in its chosen sphere of business. With nearly 20 years of seafaring experience on bulk, conventional & container vessels, coupled with extensive experience in Shipping & Commerce, makes him one of the most sought after professionals in the industry.Capt. Avinash Batra is a post graduate in "Management Studies (Shipping)", from the School of Maritime Studies, Plymouth Univ., UK. Ex-President on the Board of "The Council of EU Chambers of Commerce in India". Chairman, Indo-Spanish bi-lateral trade committee of Bombay Chamber of Commerce & Industry. Member Managing Committee, Bombay Chamber of Commerce & Industry. Past Chairman : Bombay Chamber of Commerce and Industry – Shipping and Transport Sub-Committee. Past President of Indo-Sri Lankan Society. A former ship captain with Shipping Corporation of India, who has commanded various types of vessels, including modern container vessels. He was also CEO of a liner company, operating from Mumbai.He is perhaps, the most knowledgeable professional in India in container leasing, with 25 years of experience & expertise.Capt. Somesh Batra is a post graduate in Management Studies (Shipping), from the School of Maritime Studies, Plymouth Univ., UK. Vice-President of 'World Trade Centre', Mumbai. Member of 'International Transport Committee of Indian Merchant Chamber', Mumbai. President of 'Indo-South African society', Mumbai. Mission: Pursuit of Excellence is a continuous process. Seahorse Ship Agencies Pvt. Ltd. (Seahorse) are a part of the Seahorse Group, a professional, diversified and dynamic Group which was founded in 1980. Seahorse excels in providing quality services in shipping, international transport and related areas to a growing list of prestigious customers. Seahorse, with a vision and ambition to be leaders in shipping and international transportation, operates within the frame work of integrity, commitment and compassion. This philosophy has positioned Seahorse amongst the country's premier shipping agencies, with an enviable brand equity. Seahorse's corporate infrastructure is backed by state of art IT solutions, management systems and processes. The company offers significant and strategic services at all major Indian ports and Inland Container Depots (ICDs). The company today represents some of the leading Lines in the International containerized trade. Extending technological and strategic insights gained from their vast experience in running profitable businesses, Founders ventured into logical extension of their core business. The Seahorse Group today employs over 500 qualified personnel who share the same spirit of dedication, commitment and business integrity as their founders and mentors. The Group's philosophy of providing excellence in service has been consistently reflected in its business results and an enviable client base. Seahorse is a registered Multimodal transporter operator (MTO) offers Non-Vessel Operating Common Carrier (NVOCC) services to customers facilitating their timely cargo movements to respective destinations around the globe. SSA renders port captaincy & cargo superintendency services to tramp as well as liner vessels. Our core specialty includes close supervision of cargo operations, stevedoring, minimizing cargo damage/claims and quick dispatch. Our representation is comprehensive in terms of service and coverage. We represent some of the leading brands in Tanker (including Crude, Clean Fuels and Chemicals etc) and tramp dry bulk and liner break bulk operators. We also provide guidance and assistance to Masters on Nautical affairs to ensure a safe, accident free, efficient and effective dispatch of vessels voyage. Seahorse is committed to security & safety on-board and clean seas. Asia Line Shipping (HK) Ltd.
KMTC is one of the leading lines in South Korea, offering total transportation. Operating since last 50 years, KMTC has accumulated immense experience and know-how. KMTC is known for its discipline and dependency and is most successful shipping line.KMTC sets its aim high to provide customers with more punctual and reliable service by means of 24 vessels currently deployed in their extensive service network. KMTC pursues the superior and high quality service with excellent skills and techniques.Keeping abreast with the ever changing environments of shipping industry, KMTC, with their innovative and flexible approach always makes efforts to meet the customers demand through consistent and extensive service modes and routes. Seahorse represents KMTC at all ports and ICD's in India except NhavaSheva and Northern ICD’s around New Delhi. China United Lines Ltd. (CULines), a rapidly growing state-owned shipping liner, was established on September 1st, 2005 by Unitrans Group Co., Ltd. CULines engages in international container liner service, Cross Taiwan Srait liner service，domestic liner service, Yangtze River feeder service and chartering business. With strong support from our shareholders, customers and employees, CULines has become a Specialist to offer the container liner networks of Cross Taiwan Strait direct calling services and Beibu Gulf liner services which cover the calling ports of Tianjin, Qingdao, Dalian, Shanghai, Ningbo, Shantou, Huizhou, Yantian,Shekou,Chiwan,Nansha, Huangpu, Guangzhou, Humen, Hong Kong, Haiphong and Taiwanese ports. From 2015, CULines also have extended to East Aisa, Southeast Aisa, South Asia, Central Asia Region, such as India, Malaysia, Singapore, Korea, Philippines, Bangladesh, Pakistan, etc. CULines insist the Enterprise Mission to create social benefits, protect the environments, and commit to be an international Shipping Expert and Specialist to provide our Customers the most amicable, professional and cost-efficient liner services. Sixth of June, 1971 was a historical day for the contemporary shipping industry of Sri Lanka , when the country's legislatures gave the nod to establish Ceylon Shipping Corporation as a fully government owned commercial enterprise. Infant National Carrier under the brand name of CSC grew from strength to strength and earned the credibility as a dependable carrier from Europe to Fareast and North of India to Australia . CSC helped many non-traditional export produces to enter global markets and establish footholds when the freight was a prohibitive factor and sailing opportunities were minimal at the time. In 1992, Government of Sri Lanka conferred more commercial independence to CSC enabling her to respond to market forces more quickly, by converting the Corporation into a limited liability company Ceylon Shipping Corporation Ltd . Government of Sri Lanka still fully owns CSC being one of the strategically important state entities for the island nation. CSC was the first South Asian carrier to start container services from South Asia to Europe in 1980. CSC was a key partner in the progress and modernization of Colombo port as the premier container hub port in the South Asia in late 1970s. CSC has been developing much-needed human resources for the shipping industry of the country being the Alma Mator for many shipping experts and seafarers. Across Asia we are proud of our track record in quickly setting up and then developing agencies on behalf of different principals. For each and every principal, our aim is to assist their growth and to maximize their revenue whilst using our relationships with local vendors to keep costs to a minimum. We recognize that in today’s ever-competitive market finding new sources of cargo is essential for every shipping line. That is why our marketing teams across Asia invest time and energy maintaining strong relationships with a wide range of shippers, manufacturers, trade associations, freight forwarders and NVOCCs. The synergies of Seine river ports of LE HAVRE + ROUEN + PARIS PORTS are grouped together under "HAROPA" an economic Interest group to provide end to end multimodal logistical solution and facilitate the excellent connectivity for maritime and multimodal trade flows with European states. HAROPA ports- A major maritime Hub offering highly competitive and sustainable , high performance logistic solutions(with benchmarked performance indicators for facilitation of cargo transit) vide a network of maritime and river terminals and ensuring excellent, fluid connectivity to European hinterland through the Seine river and vide a congestion free network of road & railways and Le Havre- HAROPA port have always been on the fore front of innovative logistics solutions and their path breaking Seine river logistics solutions and the globally acclaimed Single window Port community Systems- has been well appreciated by logistics community . Likewise, reconciling economic development & the environment has been the central focus at the core of activities at the ports of HAROPA. HAROPA a founder partner of SOLUTIONS COP 21 is committed to fight climate change and the steering committee has taken suitable initiatives and actions for the 21 solutions in transport and logistics along the Seine river corridor. HAROPA Ports- An Award Winning, environmentally responsible ports. 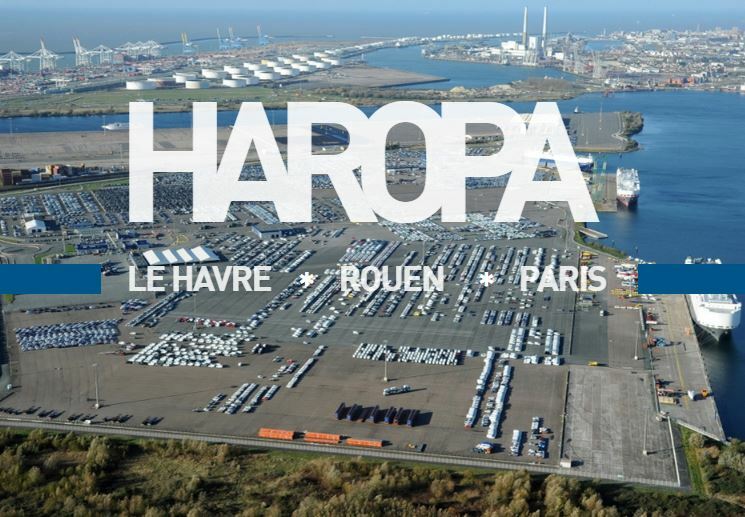 Port Of Le Havre- HAROPA port had been voted as the best " European Port") at AFLAS ( Asian Freight, Logistics and Supply chain)- award ceremony in 2012,2013 & 2014 (3 years in succession) and have been voted as the "BEST GREEN SEAPORT " in the world during the AFLAS award ceremony in 2015 & 2016 ( 2 years in succession. shipping Lines. Container Leasing, both Domestic & International. 71, World Trade Centre, Cuffe Parade, Mumbai-400 005, India. Omega Intermodal Container Services Pvt. Ltd. Containers, Placement & Manpower Resource Management. General Agents in India for YML. Cuffe Parade, Mumbai-400 005, India. Tristar Container Services (Asia) Pvt. Ltd. Domestic Leasing for Marine Containers. Seahorse Group's recent venture in Mumbai to provide customized 3PL logistics & supply chain solutions to meet evolving needs of the trade.State of the art infrastructure facilities are strategically located close to JNPT, India's premier port and are well connected with major highways.Phase I of the facilities consists of environment friendly, ultra modern storage & cargo handling warehouse of more than 35000 sqm with high-stack racking system of International standards and automatic dock levellers at each of the warehouse gates to ensure smooth operations. This facility has state of art Electrical systems, Fire fighting system along with 24 x 7 CCTV monitoring. The complex is barricaded with concretised fenced boundary wall, making it fully compliant with all international and national safety & security norms.Phase II & Phase III of Forefront are scheduled to go on stream by late 2017 & 2018 respectively to add about another 70000 sqm of warehousing capacity. 71, World Trade Centre, Cuffe Parade, Mumbai 400 005, India. A unique Integrated cargo handling facility to cater to EXIM & logistic solutions in East coast of India. state of the art - 33 acres terminal facility is strategically located close to Chennai Port - India's premier port in East coast of India & also close to Ennore and Kattupalli ports. Integrated facility also offers "Empty container storage yard" with internationally acclaimed M & R systems ( including tank cleaning facility). Environment friendly infrastructure facilities consist of an Container Freight Station(CFS) with open & closed storage, including bonded storage & transit warehousing of about 40000 sq m & cargo handling facilities.Thereby, One Stop Shop option to containerised shipping Industry. 21, Swami SivanandaSalai, Chepauk, Chennai-600 005, India. Seahorse has been in the forefront of Shipping & Logistic industry in India very closely and actively associated with various Chambers of Commerce, Port Trusts, Shipping & Trade Associations and Federations etc. Following News items may be viewed. Copyright © 2017 Seahorse Ship Agencies Pvt. Ltd. | Design by IZT Technology Pvt. Ltd.